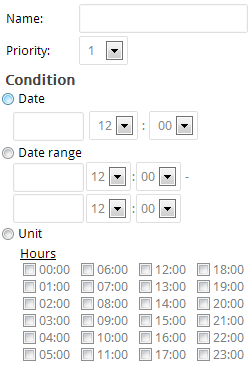 With filter you can setup price, requirement or availability related rules based on time or conditions. 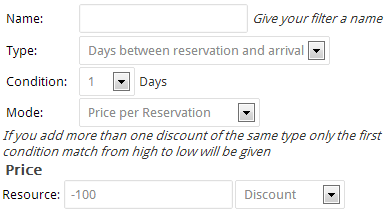 The price filter can be used to either change the base and children prices or add discounts and extra charges. Base price filter get checked for and applied for each billing unit, while discounts and extra charges only get applied once. It can filter by date range or time units. The units work by OR in the same unit and with AND between different units. That means you can filter for every Monday or Tuesday in January, but not every Monday and every February in the same filter. Filtering by condition can check for days between reservation and arrival, recurring guests by email and amount of billing units, persons, adults or children. The filter price can optionally be multiplied by the billing units, persons, adults, children and combinations thereof or be percentage. The both last filter Unavailability and Requirements are used in the reservation validation. While the unavailability filter is used to block out time, the requirement filter changes the required amount of persons, billing units or the days on which the guest can arrive and depart. All filter get ordered by priority from low to high. Only the first matched filter of a type gets applied. This can be very usefull: For example our base price is 20$ and we want to lower it to 10$ but only if exactly two persons reserve. We do this by adding a base price filter with the conditon of two persons, the price 10$ and a priority of 2. Then we add another filter checking for three persons, a price of 20$ and a priority of 1. Now if one person reserves no filter gets applied and it costs 20$, when two person reserve our first filter gets applied and it costs 10$ and if three or more person reserve our second filter gets applied and it costs 20$.